Public discourse – political and media discourse in particular – is of paramount importance to the design, implantation and public legitimation of policies that affect minority groups. Moreover, it is through public discourse that the societal fault lines are drawn and redrawn and (new) categories of insiders and outsider created. This subproject aims at uncovering the discursive construction of minority justice claims in the realm of politics, advocacy and (social) media at the European and national level. In the analysis, particular attention is paid to the discursive construction of the claims of ethnic, religious and regional minority groups, especially with respect to recognition and representation. The discursive construction of the fault lines to justice is also explored. The latter is particularly important in the times when the categories of ‘insiders’ and ‘outsiders’ are being re-defined in response to challenges evoked, among others, by mobile populations, minority claims for autonomy and language differentiation, upcoming religious fundamentalism, the experience of insecurity and/or rise of native populism. 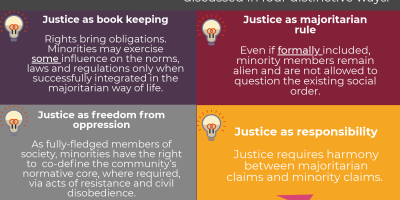 The project seeks to advance the understanding of the potential consequences of the dominant framing of justice for the capabilities and functionings of the members of different minority groups. 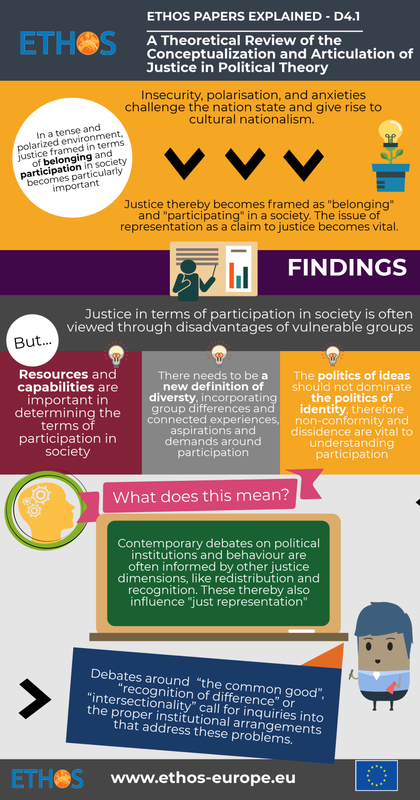 The primary goal of this study is to uncover how justice, as an abstract and complex concept and phenomenon, is conceptualized – explicitly and implicitly – in political discourse. Our interest in political discourse is driven predominantly by its presumed effects on the general public. Political debates contribute to, and often even determine, the societal recognition and social legitimation of social problems, such as specific forms of injustice, for example, as objects of state intervention; they also affect the social mobilization for action on social problems. 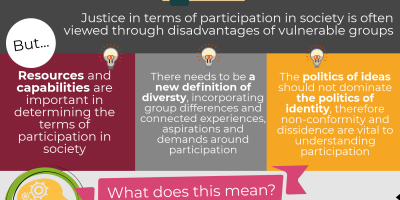 This overview presents a discussion of the political questions which concern belonging and participation in society with particular attention to the issues pertaining to representation. It aims to contribute to an empirical inquiry to the questions surrounding justice undertaken in a particular historical conjuncture where the bases of stable co-existence in complex modern societies seem to be faced by a series of economic, social and political challenges.